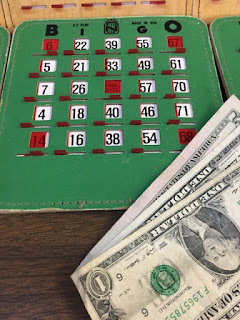 Last night I went to Bingo. Melissa, Jess and their 2 guys came too so we filled up the table! I won one game but someone else did too so I had to split it and only got $1.75 lol. Then I won ANOTHER game with 4 corners and with only 7 numbers called so I got double ($7) so that was nice! And then I won BLACKOUT but so did 4 other people. Womp womp. 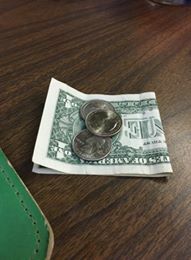 I got $8 for that lol. So I almost made back what I paid for us all to play haha. Usually we hang out after and visit but my friend Traci didn't come and the kids split so I went in the bar to hang out and finish my drink. This made me giggle a bit. Today at work I mostly worked on organizing all those files I scanned. I may have started organizing some other files on the work computer too. I don't know how anyone finds anything on there with things all over the place. I guess my brain is the only one in the office that works in an organized fashion! Well think I might go take my paddle boat for a spin in the lake. We'll see if I can get any kids to go with me. Hi Julie!!! Congrats on the wins!! That is awesome - I love bingo but I have NEVER won anything at Bingo ever! I consider my attendance a contribution every time! HA! I love that coaster - I would have taken that home to use at work - LOL!!! LOL ... 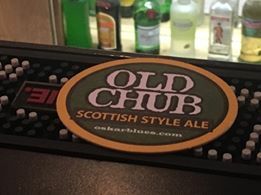 I'm an old chub too!